Red foil heart shaped box filled with Russell Stover assorted chocolates. 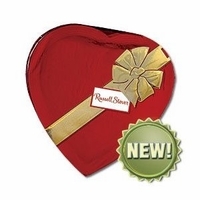 Each heart has 14 oz of fine chocolates made with real chocolate. Russell Stover still makes these chocolates in copper kettles by hand in a small quantity at a time. These process is what makes them the quality candy it is.